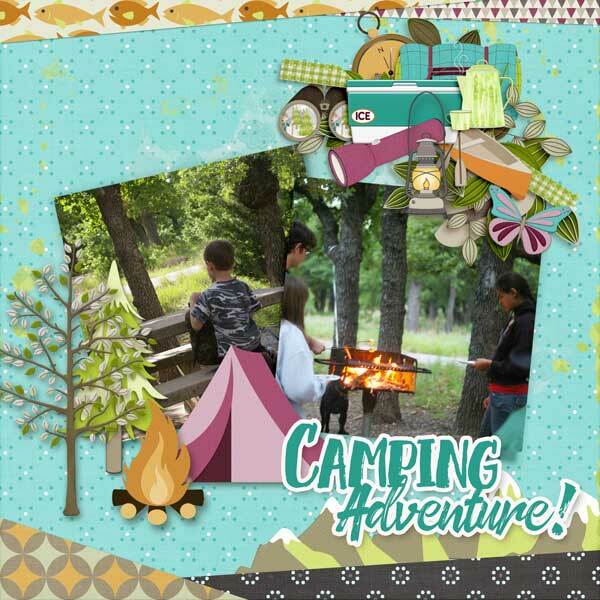 Cute kids and camping gear go together in this delightful collection. Summer Vacation is my homage to the two week vacations my family always took each summer. We packed up the station wagon and the trailer and hit the road for two weeks. We camped in National Parks and and we were rarely in the same campground more than two nights as we traveled to many destinations. I saw a great deal of the USA as a child, thanks to these wonderful vacations. Use my mini or any of my Summer Vacation collection pieces & scrap a layout. The Summer Vacation Bundle is priced at $11.99, a whopping 50% off ! Post your layout to the July 5 Wednesday Challenge Gallery thread in our forum by Monday July 17 and earn a 50% off savings on one shopping trip through my store!! That is all! Easy peasy. Looking forward to seeing your layouts in the forum AND here are a couple of layouts to inspire you!